With the Superbowl in our hometown of Minnesota, we were excited to be a small part of the action with our partner company Fire Up Creative. Each year the NFL does an event that they style after the hit show Shark Tank. They wanted a way to jazz up the NFL’s version of this mega-hit. So they added LED tiles of course. And this was the process to do that. We also partnered with our sister company, Creative Concepts, for this. 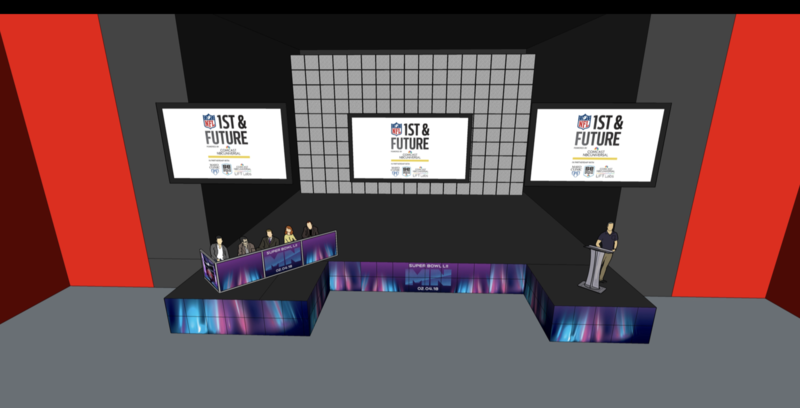 3D renderings of the stage were presented to the NFL staff. They provided background information of the must haves for their event like images, judges tables, and more. After a few back-and-forth budget considerations, and more 3D renderings, the deal was sealed. From the judges booth to the pillow-wall backdrop, the Thursday before the Saturday-show was set aside to be the build day at the Guthrie Theater. This is where the show would take place in front of a live audience. The eye candy of the show was the perimeter LED screens that ran along the front of the stage. With two knock-outs that gave the stage some dimension, the build was not your basic LED tile install. But with some pre-planning, a bit of engineering, and some extra tools and equipment, we were able to make the LED stagefront look like a permanent install. We then used the program Resolume to map the video to the walls, using Superbowl branded elements for 2018. In the end, the show went off without a hitch. 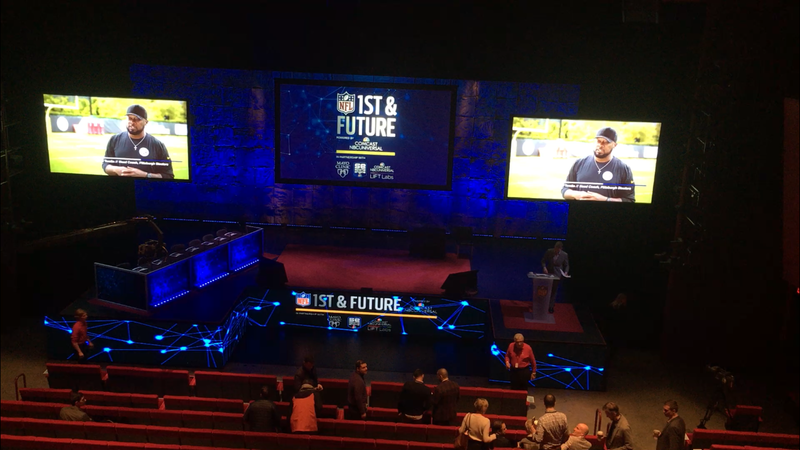 The crew at the Guthrie was a great help, and the NFL got to look at some really cool products that could play an important role on game day in the future. From the jumbotrons in all the stadiums across the NFL, to the LED tiles we provided for this event, LED screens play an important role in the league we call the NFL. Fire Up Creative is our modular LED video wall company based in Minneapolis, MN. We offer creative and unique LED screen rental solutions for all kinds of events. For more information or to rent a screen for your event, please contact us here: Contact FUC. Fire Up Video provides mobile LED Jumbotrons for outdoor events all over the Midwest, including states such as Minnesota, North Dakota, South Dakota, Nebraska, Colorado, Kansas, Missouri, Iowa, Wisconsin, Michigan, Illinois, Ohio, Indiana, Kentucky, Tennessee, and more. For more information on screen rentals, please contact us at 844-533-8848 or baum3@earthlink.net.